So you’re getting married? That’s great! And now you need to find a wedding photographer. Welcome to the abyss. A bottomless, talented pool of job-hungry photographers chomping at the bit to be chosen. Chosen to shoot YOUR wedding. How do you choose? And more importantly when you do choose, what happens next? How do you know if they did a good job? You get the photos in a reasonable amount of time? Really? Is that all you expect for a few thousand bucks? What follows is a list of things you would have never had to think about in your life unless you decided to get married. But these things will help you get the absolute most out of your wedding photography, and provide you with the best memories on planet Earth! Seriously. There’s like…tons. So what do you look for? How do you tell who you can trust with the most important day of your life? That’s not always possible. Especially if the bride and groom live in a different country! So how do I get around it? Skype! I also have multiple videos on my site where you can see me talking and breathing and being a regular human. My clients ALWAYS meet me first (in-person or otherwise) before they book. I insist. There MUST be some sort of comfortability by the time the consultation is over. Otherwise it won’t be perfect. And you deserve perfect. When is the last time you spent more than $3,000 on something? Your car? Wedding photography…good wedding photography, is pricey. Great wedding photography can run you 5 figures when all is said and done. Did you know that? Crazy huh? Make sure you set aside a good chunk of your budget for photography. More than you think too, cause you’ll want an album! Any great wedding photographer takes themselves and their work very seriously. Even if we appear to be humble, on the inside we call ourselves artists. And when you hire us to photograph your wedding, you’re commissioning us to create art for you. We don’t take that lightly. And neither should you. We live in a time where we can get almost anything we want in relatively no time at all. Wedding photographs are no exception. Since digital has taken over, thousands of photos are delivered to clients in weeks, not months. But it’s still weeks, when we’re used to get everything NOW. True art takes time. That’s part of the art. 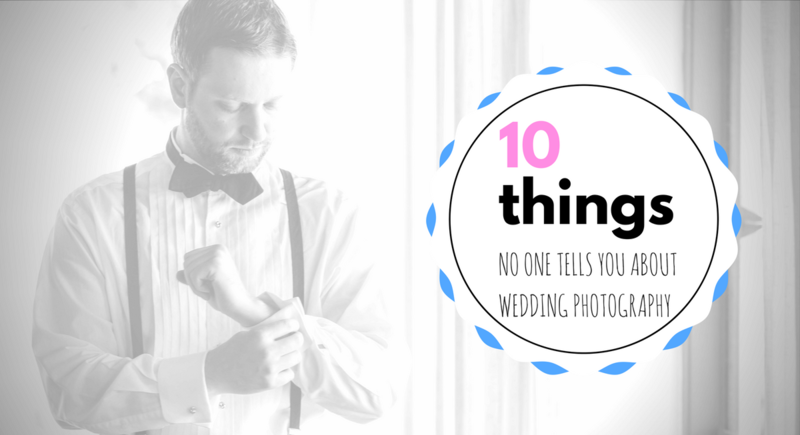 Don’t expect your photos a few days after your wedding date. The industry standard is 4-6 weeks. Smaller studios (like me) have faster turnaround times. I usually deliver my clients their final gallery within two weeks of the wedding date. I mentioned above that you might want to buy prints. I say might because most people don’t even think about it. They just assume they’ll store their wedding photos on their phone or computer. Or in the cloud somewhere. With digital, what we gained in convenience we lost in safe-keeping. Photographs are being lost to old CD’s, USB drives, and failed hard drives. Less and less newlyweds are taking the time to print their albums any more. This HAS to change! I’ll venture to guess that in 10 years most newlyweds will have hardly any experience with print media. This is a shame because Fujifilm makes some of the most beautiful photo paper you’ll ever lay eyes on. This stuff shines like you wouldn’t believe, and it lasts a lifetime. Fuji Pearl photo paper is the only paper I offer when a client orders a print from me. It has consistently proven itself to be the most stunning and vivid paper available. And my clients LOVE IT! Another option if you want to really make a statement is canvas prints. These can be made as large as 30×40″, and make the perfect wall art for your home. Museum quality materials are used to ensure a long and happy life for your prints ? Speaking of happy lives, you’ll have one if you invest in a premium wedding album! Just kidding. I’m sure you can have a happy life without one, but if you’re looking for the absolute best and safest way to store your wedding photographs, a premium album is as good as it gets. These things use top-of-the-line archival paper with inks that don’t dissolve over time. So your photos outlive even you! And you don’t have to worry about backing up hard drives. If you think about it…when you wake up the morning after your wedding, what do you have left? Some cake? A new blender. A hangover? You get to keep the photos. You don’t get to live at the venue. You can’t go on tour with the band. The catering company aren’t your personal chefs from now on. You keep none of it. Except the memories. Except the photographs. Remember that when you’re planning your wedding. Budget accordingly. Equipment Fails, Photos Get Lost. The sad truth is that technology is not, and never will be, perfect. This means that any time you hire a wedding photographer that shoots digital, your photos might be lost during the day. Any number of things could cause equipment malfunction. Sometimes images are recoverable, sometimes they aren’t. Just know that there’s always that risk that something goes wrong. As a professional, I try to come as prepared as I can possibly be. I bring three cameras with 5 memory cards and TONS of batteries. I also bring along another person (or two) that knows how to operate a pro camera. This way if I get injured or something unexpected happens, we can still cover your wedding! Many wedding photographers bring along an assistant to help with lighting, posing, etc. So although you are technically hiring one person, you might end up with more than you imagined! I often bring my assistant AND a second shooter if the wedding is large enough. That’s THREE PEOPLE! Take this into account when you’re planning where you’ll be getting ready in the morning. You don’t want to feel claustrophobic on your wedding day! So once you have your wedding photographs (digital files), how are you going to store them long-term? Let’s say your wedding photographer gives you a USB drive. Will that thing be able to plug into anything in 10 years with the rate technology is changing? Doubtful. You need a system to make sure you retain those digital files. And it’s not a question of if, but when your hard drive will fail. Which means you need a backup drive. And you’ll need to upgrade your backup drive in a few years. It all gets to be a bit exhausting. You could go to the cloud, and as of now that seems to be a REALLY great option. But who knows how secure it really is. What if a server malfunctions and your photos get deleted? Yikes. This is one of the many reasons why I nudge my clients towards print media. An album, or even just a few prints of their favorites guarantees (unless there’s a fire) that you’ll have copies of your photographs for decades. Have questions? Click here to contact me for a no-obligation consultation.